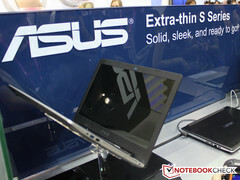 Asus opened up Computex this year with a few of their biggest Windows 8 tablets and transforming notebooks, but their show floor still housed a couple of surprises. Standing literally a foot or two away from budget X401 Series on display were the S Series ultrabooks, which include the 14-inch S46 and the 15.6-inch S56. Both pre-production models were equipped with 1366x768 resolution displays, Core i3/i5/i7 IVB options and Nvidia GeForce 600M graphics. Despite the larger screen size, the S56 will be just as thin as its smaller brother at at 21 mm (0.827 inches) but at about 300 grams (0.66 pounds) heavier at launch. Unlike the all-aluminum Zenbooks, the S Series ultrabooks will be made of plastic but with an aluminum palm rest and outer lid. Despite the plastic and metal combination, we found the models on display to be quite the looker with great stability. Unfortunately, the touchpads on both models were average at best and the screens appeared rather dark and with very strong reflections. The keyboards provided tight key travel even on the larger 15.6-inch model.